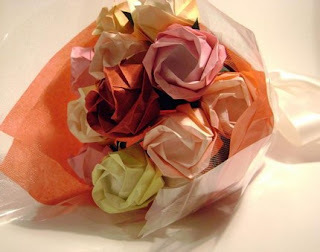 Ulixis Crafts: Amazing handmade flowers! I've been in love with therussian's flowers for a long time. They're absolutely gorgeous. I was cleaning out my favourite items this morning (deleting expired listings) when I came across these amazing fabric roses. They're just so beautiful and life-like. They're made with vintage fabric and wrapped onto a real wooden branch. Some of my other favourites include this storm bouquet made with a vintage 1970's shirt and this dozen of snow white roses. Do check out therussian ~ you won't be disappointed! And if you like what you see but want a different colour or bouquet size, just ask! The first bouquets I found were by flowerbuds. I had to stare at them for a bit, even after reading the description, to convince myself that they were made out of wood. That's right, these are wooden flowers, not real ones. They're made out of very thin pieces of birch wood. Feel free to ask for a custom order too, and check out the shop for more! My favourite is this yellow bouquet with a mix of buds, half-open and open blooms. So pretty! I next came across another old favourite: TrinityRS and her Kawasaki bouquets. There's just something about the intricate way the lovely paper is folded that mesmerizes me. 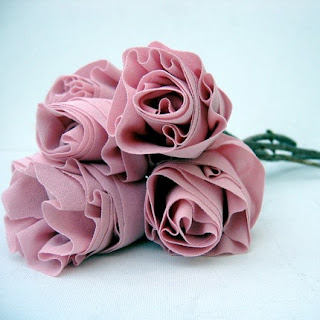 As their name suggests, they are Kawasaki origami roses. 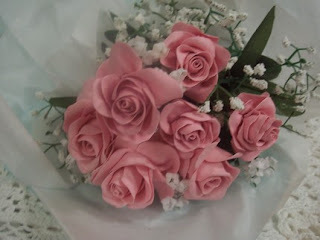 These roses are actually scented with rose oil, and would make a wonderful gift! I love this multi-coloured bouquet and I also really like this single pink rose. 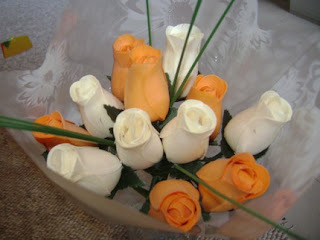 This long stem rose is folded in a tublar style, which has a cleaner and more rounded look. Be sure to check TrinityRS out. In store, she lists out paper / rose sizes, as well as the meaning behind the different colours of roses. And of course, there are a few more stunning bouquets! Oh, and I have to say ~ she's also Canadian! Lastly, I stumbled across a couple of new stores that were selling beautiful handmade flowers. The shop stjudescreations opened on February 6th of this year, and sells bright bouquets of lovely paper flowers. 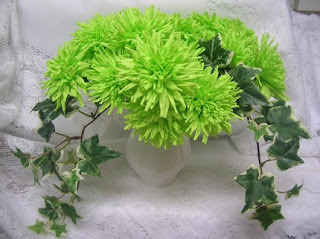 I especially love these lime green chrysanthemums and these amazing purple crepe paper roses. Do be sure to check this shop out and give some love! She's off to a great start though, and has amazing pictures of her flowers ~ so go take a look! The other new shop I found was rhondasrosecottage, which opened on March 12 this year. I think the beauty of her clay roses speaks for itself ~ as does the fact that she has already sold two gorgeous bouquets! Rhonda cuts, dyes and assembles each rose by hand. You can also get a single bloom on a clothes pin so that you can pin it onto a gift, or anything you want. While you're taking a look at all the beautiful spring blooms, don't forget to stop by this shop! I love spring, mostly because of all the flowers. The weather here is gorgeous and I'm thinking these are a good alternative to the plants I will invariably kill with lack of sunlight..
All beautiful and amazing!! Thanks for sharing all your finds.